Since its founding in 1836, the Michigan Supreme Court has changed drastically. Inefficiencies were exposed through the test of time, and corrected by visionary jurists and legal scholars who dedicated themselves to establishing the Court’s place as Michigan’s premier judicial institution. As the history of the Michigan Supreme Court has proven, justice is by no means concrete. It continually takes on a new form, according to new laws, new customs, and, most of all, according to the men and women who are called on to define it. The Michigan Supreme Court has changed significantly since its founding in 1836. It has seen the drafting of three revised Constitutions, numerous amendments and revisions of its rules and procedures, and the reduction and addition of the number of Justiceships. It has also become more recognized as an independent branch of government and, through its decisions, has firmly established its place as the state’s superior court. While the Michigan Supreme Court of the 19th Century can be characterized by many changes, disorganization, and reorganization, from the post- Big Four era until the Constitution of 1963, the Court witnessed relative stability. The most significant alterations to the Court during this time period pertained to the makeup of the Court and the Justices themselves rather than to its structure. By 1908, the number of sitting Justices increased to eight, judicial tenure was set at eight years, and the Justices’ salaries were increased significantly. In response to changing times and a changing state, a third State Constitution was fashioned and adopted by the voters in 1908. Unlike its predecessors, the Constitution of 1908 did not make any major changes to the structure of the Court. However, the state’s fourth Constitution, the Constitution of 1963, did affect the Court and the judicial system in general. The Constitution of 1963 reduced the number of Justices to seven, where it remains today, and also added the Court of Appeals. The 1960s were an era of the Court marked by important firsts. In 1961, Otis M. Smith, appointed by Governor John Swainson, became the first African-American Justice to sit on the Michigan Supreme Court. In 1973, Mary S. Coleman became the first woman to be elected and to sit on the state Supreme Court. Coleman eventually became Chief Justice – and was an integral part of solving organizational problems in the lower State Courts and promoting a unified and uniform state judiciary. Although the Big Four only sat on the bench together from 1868-1875, at least one member was on the Court from its reorganization in 1858 until 1890. During this 32-year period, a number of important judicial decisions were rendered. One such decision was handed down in 1866. The issue in the case, People v. Dean, was whether or not a man – who was part black – was eligible to vote. People v. Dean came at a very important time in U.S. history. The Civil War had just ended, and advocates for black male suffrage and equal rights in general were at the peak of their influence. Dean, who was determined to be of approximately “one-sixteenth” African descent, was found to be in violation of a Michigan Constitutional provision granting suffrage only to “white male citizens”. In his written opinion, Campbell interpreted the law to include persons with “less than one-fourth of African-blood”. Under this ruling, Dean was eligible to vote because he was only one-sixteenth African. Explaining his reasoning in this decision, Campbell asserted, “…the right of the people to determine the qualification of electors is undisputed. We are bound to adhere to the rule they have established. The right to vote is granted to a certain designated class, and to no others”. While Justices Cooley and Christiancy both concurred with this ruling, George Martin dissented, calling the exclusion of blacks from the right to vote a “rule of slavery” and questioning the courts authority to exclude persons with any level of African blood from full citizenship. In 1887, a peculiar but influential case was brought before the Court. Its official name is Sherwood v. Walker et al., but it is better known in court history as The Cow Case. The plaintiff agreed to pay $8 for a cow that was thought to be barren. When the plaintiff sought to take possession of the animal, the defendants refused to deliver it, because after the agreement was signed, the cow was found to be pregnant. The value of a cow that was not barren was $750; almost a hundred times the amount on the contract! The Circuit Court ruled in favor of the plaintiff, and the defendants appealed. The Supreme Court ruled that a party that has given apparent consent to a contract of sale may void the contract if it was made upon the mistake of a material fact, such as the fertility of a cow. Where the item actually delivered or received is different in substance from the thing bargained for and intended to be sold, there is no contract. The Cow Case has since received attention as, literally, a textbook example of contract law issues. Although these are only two examples of many of the key decisions reached by the Michigan Supreme Court during the latter half of the 19th Century, they nevertheless typify the important role the Big Four played in shaping Michigan judicial history and the respect that its members earned throughout the state and even the country. 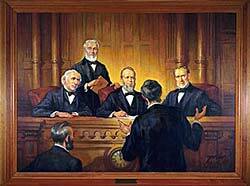 Justices Christiancy, Campbell, Cooley, and Graves are known as the “Big Four” in Michigan judicial history. As some of the first Justices to sit on the newly reorganized Court, the Big Four played a large role in shaping the Court as it is known today. They were widely respected Justices, as well as well-known legal scholars. Together, the Big Four attained for the Michigan Supreme Court the respect and authority it and its supporters felt it had long deserved, making it one of the most respected state Supreme Courts in the nation. The Detroit Capitol – Click here to view the homes of the court page. Almost immediately after Fletcher’s Revised Statutes went into effect in 1838, they not only stirred up much debate, confusion, and subsequent revision in the legislature and Supreme Court, but they became the catalyst of a growing movement for judicial reform. Governor Mason supported the movement. In particular, he recommended that new judgeships be created to preside over the Circuit Courts, allowing the Supreme Court Justices to focus on business transacted in the Supreme Court. Although the Governor’s recommendations failed to incite action in the legislature, they did receive a significant amount of support from the press and the Supreme Court Justices themselves. When the Whigs gained control of several important government positions in 1840, the reform impulse dissipated, but it took only two years for the issue to once again become a hot topic of debate. A committee report in the house blasted the current judicial system referring to it as, “A system…different entirely from that intended by its framers, illy adapted to the wants of the public, and in its operation deleterious to the intellectual and physical faculties of its ministers” (Detroit Free Press, January 23, 1893). The revitalization of the call for reform in the 1840s led to several important changes. For example, provisions that limited the Supreme Court’s jurisdiction to the geographical boundaries of the judicial circuit within which it was sitting were abolished, the number of sitting Justices on the court went from four back down to three, and the separate Court of Chancery was eliminated – its cases transferred either to the Supreme Court or Circuit Courts. The Court retained its peripatetic nature – four terms to be held once a year in different places – but the location of these terms changed in accordance with population increases. Throughout the entire decade of the 1840s, the court system, in particular the Supreme Court, was under a constant barrage of political attacks. The Michigan Constitution of 1850 made several important changes to the Court, and more were amended as the legislative and political process slowly evolved. In the end, the Court, despite many setbacks and compromises, came out with more authority and independence, a trend that continued during the latter half of the 19th Century and well into the 20th. The most significant changes resulting from the constant pressure for judicial reform throughout the 1840s were the elimination of the separate Court of Chancery, the change from appointment of superior court Justices to popular elections, and a Supreme Court comprised of four members: one Chief Justice, and three associates. Complaints against the structure of the Supreme Court date back long before the Constitution of 1835, but as Michigan began its new period of statehood, they took on an increasingly hostile tone. Although the first Constitution established the Michigan Supreme Court, the inefficiencies of some of its provisions were soon exposed. One area of complaint addressed the overwhelming workload of the newly confirmed Justices. Upon commencement of the Constitutionally established Supreme Court, the Justices inherited a backlog of pending cases from the Territorial Courts and cases that had originated in the lower State Courts. Adding to the workload, the Justices were required to preside over the Circuit Courts in their representative districts in addition to hearing Supreme Court cases. There were also flaws with the jurisdiction of the Supreme Court. The Constitution of 1835 extended Supreme Court jurisdiction only to those cases that might arise within the judicial circuit in which it was then sitting. Thus, a case that originated in the Kalamazoo district could not be heard in the Washtenaw or Wayne districts but only in Kalamazoo. Because the Detroit area was the most densely populated, and was at that time the “home” of the Supreme Court, the majority of the cases were heard in the Wayne district. jurisdiction, extended both the original and appellate jurisdiction of the Court (to a certain degree), and created a fourth judicial circuit and a fourth Supreme Court Justiceship to help alleviate some of the workload. In adding a fourth Supreme Court Justice, however, Fletcher did not raise the numerical requirement for a quorum, meaning that only two out of the four Justices needed to be in agreement. Despite Fletcher’s improvements to Supreme Court procedure, many issues were still not resolved causing widespread dissatisfaction with and criticism of Fletcher’s Revised Statutes. Both jurists and legislators complained that the Revised Statutes were obscure, conflicting, hastily prepared, and overall inadequate. Less than a year later, the state legislature began to revise the Revised Statutes, but problems and complaints persisted, resulting in calls for further reform. The Constitution of 1835 proposed a state judiciary centered around the Supreme and Circuit Courts. It established a peripatetic Supreme Court of three Justices, any two of whom constituted a quorum. One session of the Supreme Court was to be held annually in one of the three judicial circuits: Wayne, Washtenaw, and Kalamazoo. One of the primary duties assigned to the justices by the Constitution was to preside over the Circuit Courts in each of their representative districts.The Supreme Court was the only tribunal established by the Constitution. All others were provided by statute. Justices of the Court were appointed by the governor, with consent of the senate, for seven-year terms. Judges of the Probate and all County Courts, as well as Associate Judges of the Circuit Courts, were to be elected by the electors of the county in which they should reside. The Constitution also provided the Supreme Court with both original and appellate jurisdiction in common law and equity cases. The jurisdiction of the Supreme Court established by the Constitution of 1835 was in many ways identical to the jurisdiction of the territorial Supreme Court. This included limited original jurisdiction over action of right and the extra legal remedies of mandamus, quo warranto, and habeas corpus. The Court was also granted appellate jurisdiction to review Circuit Court decisions by writs of certiorari. The Constitution also established a separate Court of Chancery, allowing for appeals from the Court of Chancery to be made to the Supreme Court. On July 18, 1836, Governor Stevens T. Mason nominated fellow Democratic Party members William A. Fletcher, George Morrell, and Epaphroditus Ransom to be Chief and Associate Justices of the Michigan Supreme Court, respectively. 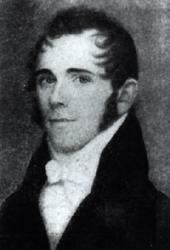 Morrell was assigned to the first Circuit Court, Fletcher to the second, and Ransom to the third. Each appointee was approved by an almost unanimous vote in the Senate. The establishment of the judicial system in the territory that became the state of Michigan differed significantly from others, particularly those on the East Coast. Other’s practices and traditions were English in origin and their legal systems were based in English Common Law. The first European settlers Michigan were French, not English, but power struggles between the French and English eventually placed control of the Michigan territory in the hands of Great Britain. In 1796, Britain ceded the peninsula and what eventually become known as the Northwest Territory to the United States, marking the first time this region had come under control of the U.S. government. Michigan became an independent territory in 1805. On July 24 of that same year, the first Supreme Court for the new Territory of Michigan was created. Its first Justices were Augustus B. Woodward, Frederick Bates, and James Witherell. The first session of the territorial Supreme Court was held on July 29, 1805. From July 9 through October 8, 1805, a series of statutes, known as the Woodward Code, was created to serve as the basis of Supreme Court legal procedure in the Michigan Territory. Complaints about the inadequacies of the Code soon began to mount. Some issues, such as indefinite tenure, were corrected; in March of 1823, an act was passed that limited the terms of Supreme Court justices to four years. However, many of the controversies surrounding the Woodward Code endured well past 1835, the year Michigan adopted its first Constitution.